In recognition of its efforts towards the community development, ‘Grama Prabodhaya’ initiated by the Rotaract Club of University of Moratuwa has been selected as the Single Club International Winner in Year 2016-17 Rotaract Outstanding Project Awards, organised by Rotary International out of the projects carried out by more than 8,000 Rotaract clubs in 167 countries across the globe. ‘Grama Prabodhaya’ is one of the sustainable community service projects organised by the Rotaract Club of University of Moratuwa with the aim of developing rural villages in Sri Lanka. In order to conduct the initial phase, Ranugalla village of Monaragala District was chosen and a series of sub-projects have been initiated to uplift the education, infrastructure, sports and health and sanitation facilities of the village. Having commenced the implementation of the project in July 2016, so far it has been able to incur a positive impact to the village in the mentioned aspects with the support of more than 100 Rotaractors of Moratuwa University. ‘Grama Prabodhaya’ is a sustainable community service initiative to develop rural villages of Sri Lanka as self-sufficient economic units. Reaching beyond the concept of material donation, this project could be stated as a collective effort to develop villages comprehensively in many aspects to uplift the quality of life of the villagers. The project saw its initiation in July 2016 by the Rotaract Club of University of Moratuwa, the oldest university based Rotaract club in Sri Lanka which has a proud legacy of 21 years of service to the society. Ranugalla, a small rural village in the Monaragala District, which gives residence to about 200 families was selected for the first unfolding of the project. According to the survey conducted by the ‘Grama Prabodhaya’ team, it was evident that this village was facing many recurrent issues due to the lack of proper infrastructure facilities, health and sanitation facilities as well as due to the gaps in education and employment opportunities. The only school in the village is Mo/Ranugalla Kanishta Vidyalaya, which provides education for around 200 students from grade 1 to 11. The school doesn’t have permanent teachers for some of the main subjects. Nor do they have a science laboratory, a proper library or good sanitary facilities. The villagers face many health issues due to the lack of clean drinking water. Female unemployment is also a rising issue in the village. Abiding with the United Nations, Goal 10 of sustainable development goals – “Reduce inequality within and among countries”, Rotaract Mora developed a three year plan to address many of these issues that are within our capabilities and also to enhance infrastructure, health, sanitation, education and sports facilities of Ranugalla village. Thus ‘Grama Prabodhaya’ was initiated comprising of a series of sub projects in order to cater these requirements. As university undergraduates, naturally the foremost focus was to develop education in the village and encourage students to reach beyond their boundaries of poverty through the means of education. Hence the first phase of ‘Grama Prabodhaya’ was dedicated to education. Alongside which the Rotaract Club of University of Moratuwa opted to focus on health issues and community development. 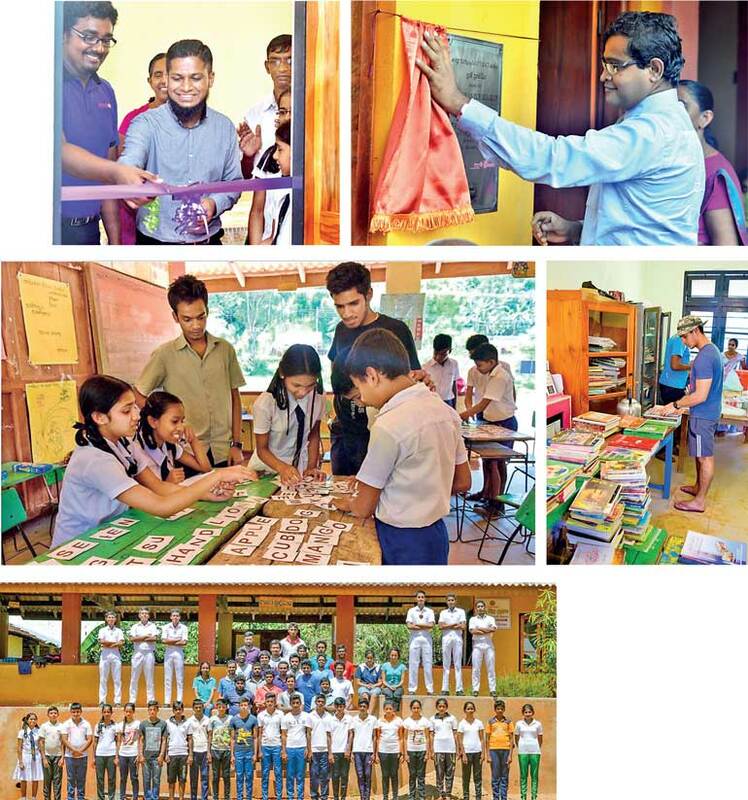 The Rotaract Club of University of Moratuwa has constructed a science laboratory and two class rooms to uplift school children’s learning conditions. The building was opened on 29 April in a splendid ceremony with the participation of over 250 teachers, students, parents and Rotaractors. The project Sci-Hub is initiated to collect funds to fully equip the lab and to assist students with the laboratory experiments in the science curriculum. This project is conducted under the supervision of the school principal and the School Development Society of the school. It has also succeeded in being a collective point for villagers (mostly parents) who took turns to volunteer their assistance to the construction process. The students of Ranugalla Kanishta Vidyalaya don’t have the luxury of a proper library. The Principal of the school has also allowed the general public of the village and nearby villages to use the school library to inculcate the habit of reading among villagers in general. But the library itself lacks a wide variety of books. Under the project ‘Bridge of Hearts,’ the Rotaract Club of University of Moratuwa is collecting books to initiate a new library in the school. A few book collection points were arranged within the University as well as at the Bandaranaike Memorial International Conference Hall during the Colombo International Book Fair – 2016. As of now it has collected over 2,000 books. It believes that this attempt would eventually contribute in improving the literacy of the entire village. The comprehensive library was opened for public use since April. The Rotaract Club of University of Moratuwa has have conducted ‘Intellect 2016,’ an O/L seminar series for subjects – Science, Mathematics, English, Sinhala and Buddhism for a period of three months from September – November 2016, targeting the students facing G.E.C O/L examination in December 2016. It came to know that most students cease their education at the end of O/L, and only a small percentage would continue education up to A/L, following which it conducted a series of motivational and career guidance sessions mainly focusing on encouraging students to pursue higher education and explore different career paths available for them. Both the seminar series and the sessions received positive feedback from both students and teachers. The students have achieved 100% pass rate in all subjects with the exception of English language. Thus ‘Inspirer 2017,’ a two-day English camp, was conducted at the school premises to instil in students a desire to learn and improve their English language skills. The Rotaract Club of University of Moratuwa has introduced an art and literary competition (‘Akurata Aruthak’) for all students from grade 1 to 11, with the objective of evoking the hidden talents of aesthetics among the school children. Currently the only sport available in the school is volleyball. The Rotaract Club of University of Moratuwa has conducted a volleyball coaching camp, a sports science knowledge sharing session followed by friendly matches between the school and the Rotaract team with the aim of supporting the school players. Additionally, it donated sports equipment for volleyball as well as few other sports with the objective of introducing a number of new sports to the school. The Rotaract Club of University of Moratuwa organised a leadership development camp (‘Lead with Spark’) in collaboration with the Interact club and the Prefects’ Guild of Ananda College in order to strengthen and inculcate leadership skills in students of Ranugalla Kanishta Vidyalaya. The sessions and the team games focused on training students to face challenges with courage and confidence. The Rotaract Club of University of Moratuwa is assembling 200 gift packages with necessary school items such as school shoes, bags, water bottles, books and other stationary items, to present to all students in the school. As the economic level of most families in the village is quite low, these are luxuries which students could not afford. ‘Healing Hands,’ the annual health camp of Rotaract Mora, was conducted in Ranugalla, with the participation of a panel of six highly qualified doctors along with a mobile dental unit. A series of knowledge sharing sessions was carried out by the panel of doctors addressing prevailing health issues in the village such as ‘Prevention of non-infectious diseases’ and ‘Providing a balanced diet within the affordability of the family’. The Rotaract Club of University of Moratuwa has partnered with Millennium Information Technologies (MillenniumIT) a subsidiary of London Stock Exchange Group to bring its vision to action. It has received their generous financial assistance to construct the laboratory/ library building and their continuous support throughout the implementation of all sub projects. It has also organised a sub project to paint the new school building (‘Rainbow of Hope’) along with the CSR team of MillenniumIT. It has also received the assistance of numerous community organisations. The relationship it has built with the community of Ranugalla village has become a major strength for the successful implementation of the project. The school principal and the staff of Ranugalla Kanishta Vidyalaya along with the Head Reverend Thero of the village temple and the village community were involved in the planning and implementation of the project, and they provided food and accommodation for the Rotaractors during every project. The Rotaract Club of University of Moratuwa worked in collaboration with Sasnaka Sansadaya (a not-for-profit organisation promoting education) and the Director of Passara Zonal Education Office (for projects involving the school) and with the Regional Director of Health of Monaragala District, Hingurukaduwa Rural Hospital and Okkampitiya Rural Hospital (for ‘Healing Hands’). Rotary club Colombo West and District Committee of Rotaract District 3220 have shown their voluntary support throughout the implementation of the project. The Rotaract Club of University of Moratuwa continues to receive numerous donations to the library project from various Rotaract clubs of Rotaract District 3220, the general public and well-wishers. Thus, building a sustainable network around ‘Grama Prabodhaya,’ the Rotaract Club of University of Moratuwa will confidently take the project to the next phase. Phase 2 of the project will be dedicated to providing clean drinking water to the entire village by constructing an artificial tank and a water purifier. It has also organised to partner with different organisations to introduce new employment opportunities to the unemployed citizens, especially the women in the village. It will also focus on bringing expertise health care to the village through more projects like ‘Healing Hands’ and is planning to uplift the ICT knowledge of the students through building a computer laboratory in the school. The team of ‘Grama Probodhaya’ consisting of nearly 100 Rotaractors whose aspiration and the consistent commitment to develop a rural village situated 240 km away, is the main strength behind the successful implementation of Phase 1 of the project. Rotaract Mora which has a 200+ membership has the capability and resources to take ‘Grama Prabodhya’ forward in the years to come. Reducing inequalities within the country has been the base on top of which the vision of ‘Grama Prabodhaya’ was built. The Rotaract Club of University of Moratuwa believes enhancing educational facilities and inspiring a younger generation to pursue higher education as main means of achieving this goal. In the long term it will contribute to reduce unemployment rates within the community. But for a rural village such as Ranugalla it is important to first assist the community to develop as a whole surpassing many difficulties they continuously face due to the lack of access to resources and opportunities. Thus, providing access to proper health and sanitation facilities while promoting disease prevention and treatment and providing employment opportunities and thus supporting economic and community development is the ideal pathway to reach closer to this long term goal. With that vision in mind, the Rotaractors of University of Moratuwa have brainstormed to come up with a community service initiative that can sustain and improve over the years to come with the support of various communities and organisations combined with the strength of the club membership. Surpassing all projects carried out by over 8,000 worldwide Rotaract clubs in 167 countries, ‘Grama Prabodhaya’ was adjudged as the ‘Single Club International Winner in year 2016-17 Rotaract Outstanding Project Award’ by Rotary International’. This prestigious award was won for the first time by a Sri Lankan Rotaract club. As Rotaractors upholding the motto, ‘Service Above Self’, the Rotaract Club of University of Moratuwa humbly acknowledges this award as an appreciation of its commitment. It believes that this would provide motivation for its club members to successfully implement the upcoming phases of ‘Grama Prabodhaya,’ the quest of assisting this rural community ‘in the pursuit of their dreams’.